Big Fish Audio's DVD: Urbanic Guitars is a modern dynamic guitar sample collection made with premium gear, experienced talent and high-end signal path, and developed for a multitude of professional applications. 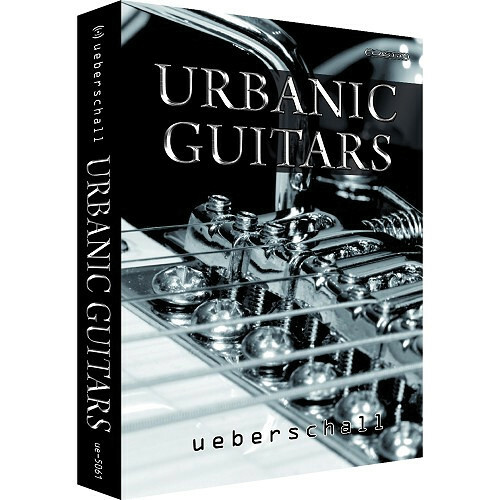 Ueberschall provides an abundance of full impact guitar phrases and organizational options to fit with your approach to the implementation of guitar content. Urbanic Guitars stacks up with 125 themes and 780 loops of smashing guitar melodies, hooks, riffs, and licks. The 1.77 GB content ranges in tempo from 60 to 130 BPM. Urbanic Guitars features essentials of the urban domain, with genres like hip hop, R&B, reggae, soul, funk and many more. The themes are divided into three folders of loop packs: Acoustic, E-guitar 1 ( Gibson ES style ), and E-guitar 2 ( Fender Strat style ). Within these three folders are a wide spectrum of contemporary playing techniques which revolve around the axis of urban. Each theme consists at least of a main part and a variation. The main and variation mixes are composed of two separate guitar loops, which are, as usual, broken out into single elements. A few of the themes provide up to 3 variations. Furthermore, each variation is different in the way of vibe and accent, to deliver the most possible variety. The given structure and features like labeled key signature and tempo information, makes it as easy as possible to find a groove that will match your tracking needs and goals. Additionally the Elastik Player offers you a lot of DSP functions to adjust the phrases to further fit your productions / creations. 780 loops of guitars smashing melodies, hooks, riffs, and licks.